This season Auritech is working with talented 16 year old racer Thomas Strudwick as he competes in the British Talent Cup and British Motostar Championship. It has been a brilliant start to the year for the West Sussex based rider, as he leads the inaugural British Talent Cup after two rounds, and we caught up with him to get some thoughts on the season so far. “It’s been a brilliant start to season,” he said. “I won the opening round of the British Talent Cup at Donington Park in April and then followed it up with another two podium finishes when we returned there alongside the world superbikes in May to retain the championship lead. “Those races were really close and I enjoyed battling with Max (Cook) and Rory (Skinner). They are quick riders with experience from the Red Bull MotoGP Rookies Cup, so to be running right up there with them and leading the championship is really satisfying. I’m also riding the standard class in the British Motostar championship this year and am fourth in the points after the first four races. We got on the podium last time out but there’s still some work to do to get the bike in the best condition as the season goes on. 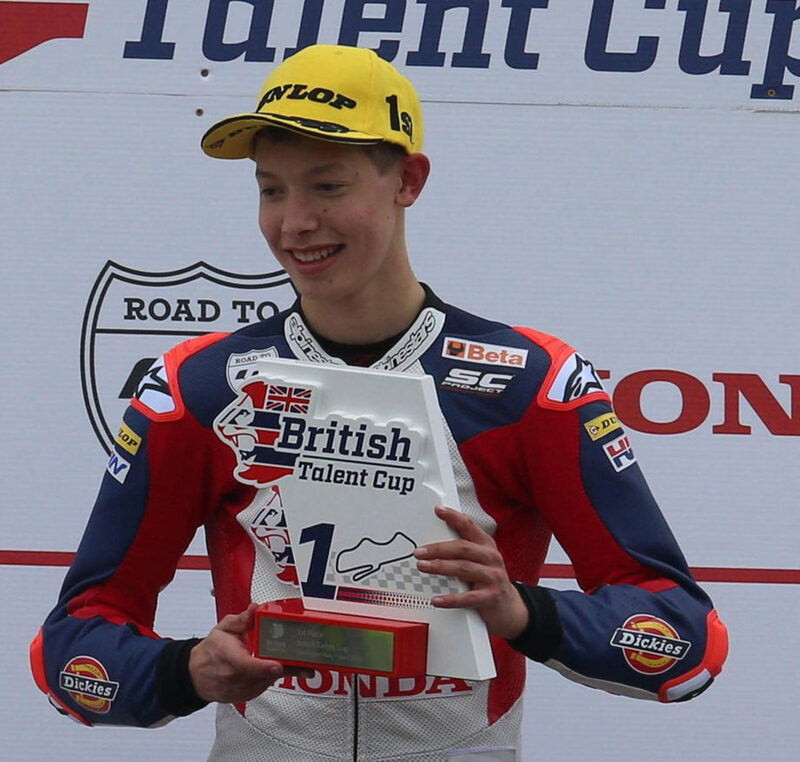 “Riding in the British Talent Cup is a great opportunity. We have a riding coach, Dani Ribalta, who does everything to make sure we are in the best possible condition, and all the staff and mechanics are hugely involved and really focussed on pushing everyone to a higher level. “This year I am again wearing a set of Auritech custom fit earplugs. I’ve worn Auritech for over three years now. I’ve tried various brands over the years, including other custom fit brands, but I like the fact that the Auritech ones cut out the wind noise while still allowing me to hear what the engine’s doing. I can also have a conversation with my mechanics without taking the plugs out, and they are comfortable too. “Last week I was at Silverstone, on a track day with Ducati and my sponsor Moto Rapido. I got a chance to ride the new Panigale V4 around the full MotoGP circuit and went the fastest I had ever been on a bike, 180mph down the Hangar straight, and the effect was just the same as on my Moto3 bikes. The plugs cut out all the wind noise but I could still hear the engine underneath me. Ear protection is really important to me, as I don’t want to have problems with my hearing in 20 years time or so, and I’m glad to be working with Auritech again this year.